Luke Gregerson was placed on the 10-day DL with a right shoulder impingement. MINNEAPOLIS — The St. Louis Cardinals placed struggling reliever Luke Gregerson on the 10-day disabled list Wednesday with a right shoulder impingement. Gregerson, who signed a two-year, $11 million contract with St. Louis over the winter, has an 8.64 ERA in 12 appearances this season. The 34-year-old right-hander recorded just one out in Tuesday’s 4-1 loss at Minnesota and was charged with two runs and two hits. Matheny said Martinez will have another MRI this week to determine whether his right lat strain is improving. Martinez won’t be ready to return this weekend when eligible and the team is considering John Gant for the open spot Saturday in St. Louis against Philadelphia. 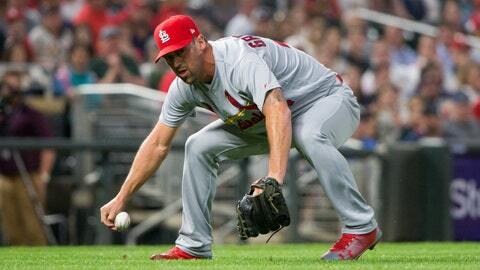 “Obviously, he’s going to miss the start here, but we’re still optimistic,” Matheny said of Martinez.